My bassoon reed was good yesterday, now today it is stiff and different. As a student, I never understood how to tell between a good bassoon reed and a bad bassoon reed. I knew when I thought the reed could do the things I wanted it to do one day, but then the next day, the bassoon reed would stiffen and I had no idea how to get the bassoon reed to play the dream way it played the day before. 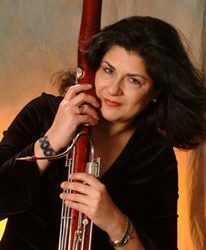 I never felt I had a bassoon teacher who could teach me step by step the process of making the reed thinner in the right area or getting the wires tightened to the proper strength again so it played well from day to day. So, as a professional bassoon player, I got very serious about how have consistent bassoon reeds in my case at all times and this is the process I suggest.The First thing is to rotate at least 3 bassoon reeds at a time. This means you never play the same bassoon reed two days in a row and the bassoon reeds will dry in between days of playing. Now soak your reed as you would for playing, then check all of the exposed wires for tightness. The shrinking of the cane is a natural process of cane during its lifetime it and the wires will get loose. Then play on the bassoon reed. If the reed stiffens you likely need to lightly drag a sharp knife in rows starting from the back of the bassoon reed to the tip, going from middle to the left then middle to the right, until you have lightly scraped what is affectionately known as “crud” the reed with sharp knife. You probably have removed next to no cane at all. After trying this play the bassoon reed. You may find that you have the dream reed you played yesterday back to its attractive playing characteristics today!